The pneumatically-operated, bench top system develops 1/2 ton of down force and is ideal as a single point unit for large insert or staking operations. As a stand-alone unit, it is a natural for secondary operations at a molding press or assembly line. 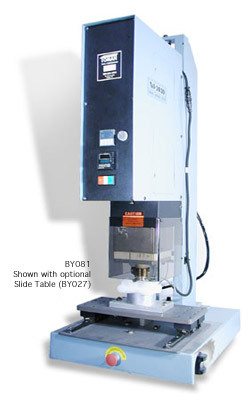 The unit has a screw adjustment to easily raise or lower the head (from 7-1/2″ to 19-1/2″).